up to 7 business days to ship. Please email us for availability if you need an item quickly. Mondor 4453 Polartec Fleece Figure Skating Pants will keep you warm during the coldest of days on the ice. Super soft and stretchy the innovative fabric allows the body's moisture to pass through the garment keeping you dry and resists odor causing bacteria. The Ice Fire HP281 Fancy Swirls Fleece Figure Skating Pants are made with power stretch polartec fleece and a rhinestone fancy swirls appliqué. Soft and warm. Available in Child XS - Adult L. Black Only. ChloeNoel P22 3" Waist Figure Skating Pants - Crystal Design. Comfortable and warm. Choose from several designs in Child XXS - Adult XXL. The ChloeNoel P622F 3" Waist Fleece Figure Skating Pants are made of lightweight fleece. Choose from several designs in Child XXS - Adult XL. Balera Full Length Black Leggings. 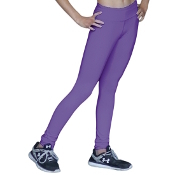 These classic full-length leggings are constructed from 4-way stretch matte nylon/spandex for comfort and ease of movement and feature an elastic waistband for a secure fit. Made in USA. Available in Child and Adult sizes. bZipt Zippered Fleece Leggings. A revolutionary way to put on and take off leggings without removing shoes, boots, or skates! Great for Gymnastics, Dance and Skating. ChloeNoel P23 2" Waist Figure Skating Pants . Innovative fabric allows the body's moisture to pass through the garment. Available in Child XXXSmall to Adult Large. The ChloeNoel P636F Spiral Fleece Figure Skating Pants are made with light weight fleece. They will keep you warm during those cold days on the ice! Available in several colors from Child XXXSmall to Adult Large. ChloeNoel PS792 3"Color Waist w/ Pocket Skating Pants -Clearance. These pants are a solid lycra over the heel skating pants with front pockets. Made in the USA. Choose from several colors in Child XXS to Adult XL. For more bling, a AB crystal color block can be added! The ES Performance Laia Capri Pants offer a versatile design which allows them to be used for yoga, running or any other sport activity. Available in Adult XSmall to Adult XLarge. ES Performance Melange Long Sleeve Half-Zip Top. Ultra lightweight, moisture wicking, stretch fabric is super soft. Great for outdoor sport activities in cooler weather. The reflective lines provide aditional visibility in the dark. Available in several colors in Adult XSmall to Adult XLarge. The ChloeNoel PS711 Skinny Yoga Pants are a solid lycra pants with front pockets. Made in the USA. Choose from several colors in Child XSmall to Adult XLarge. Add swarovski AB crystal block for extra bling! The ChloeNoel P22 3" Waist Ice Skating Pants are comfortable and warm. Choose from several designs in Child XXS - Adult XXL. The ChloeNoel PS792 3" Color WaistIce Skating Pants are a solid lycra over the heel skating pants with front pockets. Made in the USA. Choose from several colors in Child XXS to Adult XL. For more bling, a AB crystal color block can be added! ChloeNoel P22 Crystal Figure Skating Pants. These 3" Waist Ice Skating Pants are comfortable and warm. Available in Child XXS - Adult XL. Clearance! ChloeNoel P622F 3" Waist Fleece Skating Pants are made of lightweight fleece. Choose from several designs in Child XXS - Adult XL. Bzipt Cotton/Spandex Zip on Zip off Leggings. A revolutionary way to put on and take off leggings without removing shoes, boots, or skates! Great for Dance, Gymnastics and Skating. Available in several colors. Elite Sports "Figures" Figure Skating Pants are made from a quick dry polyester spandex that will keep you warm and dry during skate practice. Available in Child Small to Adult Large. Ice Fire Fleece Figure Skating Pants - Colorful Layback. The Ice Fire Fleece Figure Skating Pants are made of polartec fleece to keep you warm. Features a "Colorful Layback" rhinestone design down one leg. Choose from several colors in Child XS - Adult L. Ice Fire FLEECE Figure Skating Pants - Skate Swirls. The Ice Fire Skate Swirls figure skating pants are made with polartec fleece to keep you warm. Rhinestones and Rhinestuds sparkle around the left leg in Spiral Skates design. Choose from Child XS - Adult L.
Ice Fire Poly/Spandex Figure Skating Pants - Colorful Layback. The Ice Fire Figure Skating Pants are made of high performance fabric thatfeatures a "Colorful Layback" rhinestone design down one leg. Choose from several colors in Child XS - Adult L. Ice Fire Poly/Spandex Figure Skating Pants - Skate Swirls. The Ice Fire Swirls figure skating pants are made with rhinestones and rhinestuds that sparkle around the left leg in Spiral Skates design. Choose from Child XS - Adult L.
Ice Fire Poly/Spandex Figure Skating Pants - Venetta Elegance. Ice Figure Venetta Elegance Figure Skating Pants are a stylish and elegant look with glamorous jet black rhinestone design down right leg. Available in Child L - Adult L. Click on images to view sizing chart. MATTE FINISH, VERY THICK HEAVY WEIGHT ChloeNoel BP10 Thermal Legging Figure Skating Tights. Is your rink really cold? Can't find tights thick enough. These are the solution. Thick legging tights made of a polyester/spandex blend. Available in Child XXS - Adult L.
ChloeNoel P618F Figure Skating Pants are made with lightweight fleece and 2-tone piping. The fabric wicks away moisture and resists odor-causing bacteria. Choose from Child XXS - Adult L. Available in several colors. The ChloeNoel P622F 3" Waist Ice Skating Pants are made of lightweight fleece. Choose from several designs in Child XXS - Adult XL. ES Performance Flower Skating Pants - Clearance! Made from a quick dry polyester spandex that will keep you warm and dry during skate practice. Choose from several colors in Child Small to Adult Large. The Ice Fire BP789 Figure Skating Pants are made with power stretch polartec fleece. Soft and warm. Available in Child XS - Adult L. Black Only. Ice Fire FLEECE Figure Skating Pants - Criss-Cross. The Ice Fire fleece ice skating pants feature a Criss Cross design made with Shimmer Matrix fabric. These pants are a perfect match with the Criss Cross Pattern Jacket. Available in several colors in Child XSmall - Adult Large. Ice Fire Polartec Fleece Pants will keep you warm during practice. Rhinestones and Rhinestuds sparkle around the left leg in "Swirls" pattern. Choose from several colors in Child XS - Adult L.
Ice Fire Poly/Spandex Figure Skating Pants - Love & Skate. The Ice Fire Figure Skating Patns are made of high performance fabric that features a rhinestone "Love & Skate" design down one leg. Choose from several crystal colors in Child XS - Adult L. Ice Fire Poly/Spandex Figure Skating Pants - Pair of Skates. The Ice Fire Figure Skating Pants are made of high performance fabric. The "Pair of Skates" rhinestone design down one leg is made with high quality AB crystals. Choose from several colors in Child XS - Adult L.
Ice Fire Poly/Spandex Figure Skating Pants - Skate & Ornament. The Ice Fire Figure Skating Pants are made of high performance fabric that features a "Skate & Ornament" rhinestone design down one leg. Choose from several colors in Child XS - Adult L. Ice Fire Poly/Spandex Figure Skating Pants - Swirls. The Ice Fire Swirls figure skating pants are made with rhinestones and rhinestuds that sparkle around the left leg in "Swirls" pattern. Choose from Child XS - Adult L.
Not quite sure what to buy for your special skater? Try a gift certificate! Gift certificates can be used to purchase any item. Clearance! Jerrys S130 Fleece Ribbon Ice Skating Pants. Black fleece legging pants with an elastic waist. The hourglass design in complementary accent colors along each leg gives a long, slim look. Choose from Youth S - Adult L.
These Straight Leg Pants are made with a fast-wicking fabric that resists odor-causing bacteria. Perfect for skating or any off ice excercise. Available in Child XXS to Adult XL. ChloeNoel PS96 Crystal Spiral Figure Skating Pants will give sparkle to your practice. Choose from several colors in Child XXS - Adult L.
Clearance! ChloeNoel P02 Side Stripe Figure Skating Pants. These Sporty Striped Ice Skating Pants help you stay warm during practice. Choose from several colors in Child XS - Adult XL. Ice Fire Poly/Spandex Figure Skating Pants - Criss-Cross.. are made of high performance fabric and feature a criss-cross pattern down one leg. Available in several colors in Child Small - Adult XSmall. Ice Fire FLEECE Figure Skating Pants - Skate & Ornament. The Ice Fire figure skating pants are made with power stretch polartec fleece and have a "Skate & Ornament" rhinestone design down one leg. Choose from Child XS - Adult L. Jerry's 320 Fleece Lined, Side Zip Warm-Up Pants. These lined warm up pants have full side zippers, water resistant nylon outer with polyester fleece lining. Great unisex pants for skating, dance or cheer! Available in Youth S - Adult L. Team Pricing Available! ChloeNoel P76 Color Piping Figure Skating Pants are made with heavy weight french terry knit inside and jersey face for semi gloss look. Choose from several colors in Child XXS - Adult L. ChloeNoel PS35 3" Waist Color Band Ice Skating Pants are comfortable and warm. Choose from several colors in Child XXSmall to Adult Large. ChloeNoel PS08 Swirls Rider Ice Skating Pants are made with heavy weight french terry knit inside and jersey face for semi gloss look. Choose from several colors in Child XS - Adult L. Ice Fire FLEECE Figure Skating Pants - Love & Skate. Ice Fire Fleece figure skating pants have a Love and Skate crystal design down the leg. These pants are a perfect match with Ice Skating Jacket "Skate and ornament". Choose from several crystal colors in Child XS - Adult L.
The Ice Fire Figure Skating Pants are made with polartec fleece power stretch and Multi mix skating designs applique down the leg with approx. 1,500 AB crystals. Choose from Child XS - Adult L. Ice Fire FLEECE Figure Skating Pants - Pair of Skates. Ice Fire Figure Skating Pants are made with power stretch polartec fleece and feature a "pair of Skates" crystal design down one leg. 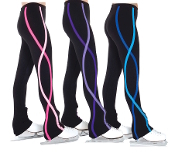 Choose from several colors in Child XS - Adult L.
The ChloeNoel P22 3" Waist Ice Skating Pants are comfortable and warm. Choose from several designs in Child XXS - Adult XXL. ChloeNoel P83 Fleece Figure Skating Pants are made with jersey faced exterior, brushed inside fabric for extra comfort and warmth. Choose from Child XXS - Adult XL. Available in Black Only or with a crystal design. The ChloeNoel P02 side stripe figure skating pants help you stay warm during practice. Choose from several colors in Child XS - Adult XL. ChloeNoel P06 Spiral Figure Skating Pants are made with heavy weight french terry knit inside and jersey face for semi gloss look. Choose from several colors in Child XXXS - Adult L.
ChloeNoel P26 Swirls Figure Skating Pants. Stay warm on the ice during practice. Choose from several colors in Child XS - Adult L. Stay warm during practice with the ChloeNole P86 vintage print ice skating pants. Very soft and super comfortable next to the skin. Available in Child XS - Adult L.